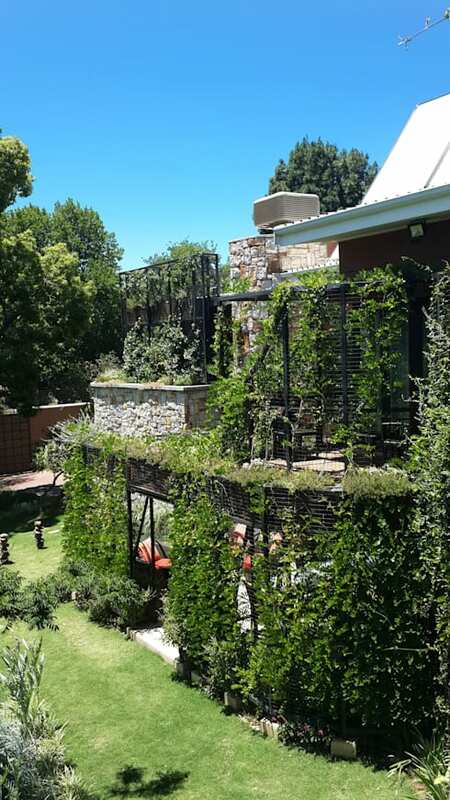 Today we are going to explore a local home in Johannesburg, designed by architect professionals Environment Response Architecture. 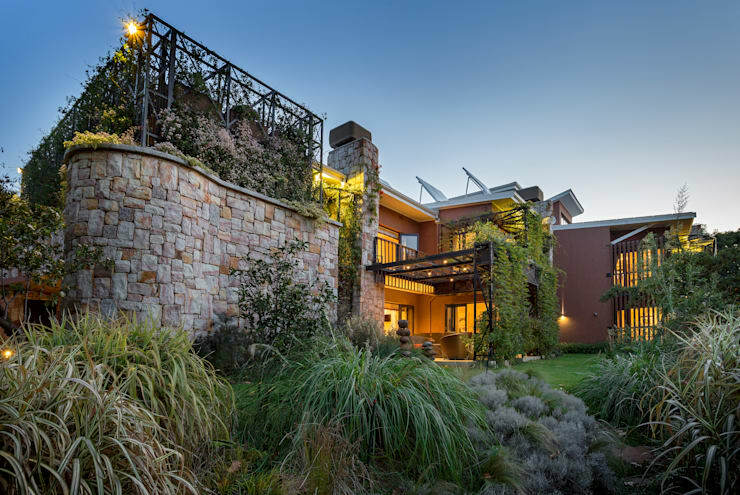 Nicknamed House Jones and valued at R10.5 million, the home has been designed around concepts of sun protection, solar radiation, energy and water consumption, landscaping and sustainable systems. The architects have worked hard to merge comfort with sustainability, efficiency and originality. This hasn't impacted on the beauty of the home, however. As the architects have explained, ’The home challenges the conventional ideas of domestic architecture and offers a new 'green aesthetic'. Are you intrigued to explore it further? Let's take a look! From the outside of the home, we can see how different materials work together, including wood, stone and brick. Contrasting with and complementing one another, they also work in harmony with nature thanks to the impressive garden that is packed with personality and beauty. 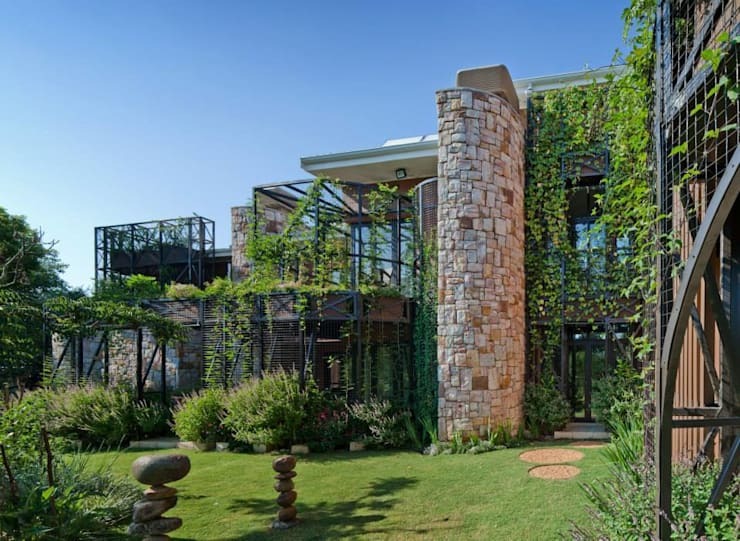 The designers wanted a mediation between the interior and the exterior spaces, which is why they have included pergolas or steel structures throughout the exterior of the home, where plants, creepers, flowers and vines are interwoven. This integrates nature into the look and feel of the home. These steel structures also provide solar shading, naturally insulating the home. From this angle, we can also see how lighting has been used throughout the facade to not only enhance the details and design, but also provide functionality so that the family can see what they are doing as they walk through the garden. Have a look at these other: Outdoor lighting ideas for modern houses. If we examine this building a little more closely from a different angle, we can see how the focal point is a long stone pillar, which sets the tone for a gorgeous and aesthetically pleasing home. The designers have opted for lots of glass throughout the structure, allowing the sun to penetrate through the living spaces—a wonderful and modern design tool for winter. In summer, the home is shaded thanks to the solar shading. You may also be interested to know that the house collects rainwater and recycles it to water the garden, lowering the family's carbon footprint. There is also a storage dam in the garden, which creates biodiversity in this urban spot. In this image, we can see that the home features a variety of patios and balconies, which allow the family to make the absolute most of being outside. 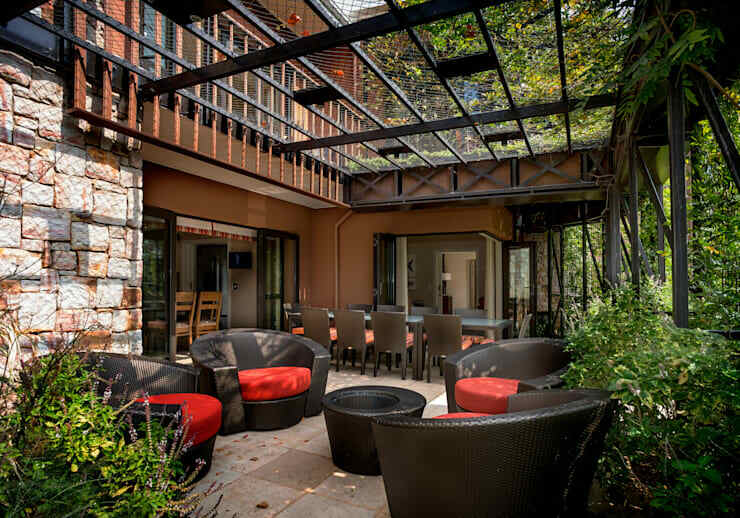 These outdoor spaces are enhances by the steel structures that we spoke about earlier, which truly make the residents feel like they are in the middle of the countryside or a forest, despite the house being in one of the most busiest cities in South Africa! This is very important! You want your home to be a little haven where you can escape from the hustle and bustle of everyday life. Investing in a gorgeous garden or patio and balcony spaces can breathe new life into your home as well as your lifestyle. Have a look at these: Eye-catching garden ideas you should consider. If we have a look at one of the terraces on the property, we can see just how homely and comfortable it is, as well as being incredibly stylish and chic. The patio furniture is a dark, chocolate brown with splashes of red in the form of comfortable and cosy cushions. While it is durable and functional, it also enhances this entire space. Couldn't you imagine relaxing on one of these cushy armchairs while reading a book? We can also see that this space is shaded thanks to the variety of plants and flowers that have been used to decorate this area. It feels so peaceful and tranquil out here. We can also see how the home opens up onto this space, thanks to the large glass sliding doors. This extends the interior living space, creating a larger home. The patio also features a dining area where the family can host dinner parties or summer lunches under the sky. This would also be a great spot to install a braai! The patio spills out onto the garden, merging the interior and the exterior seamlessly. 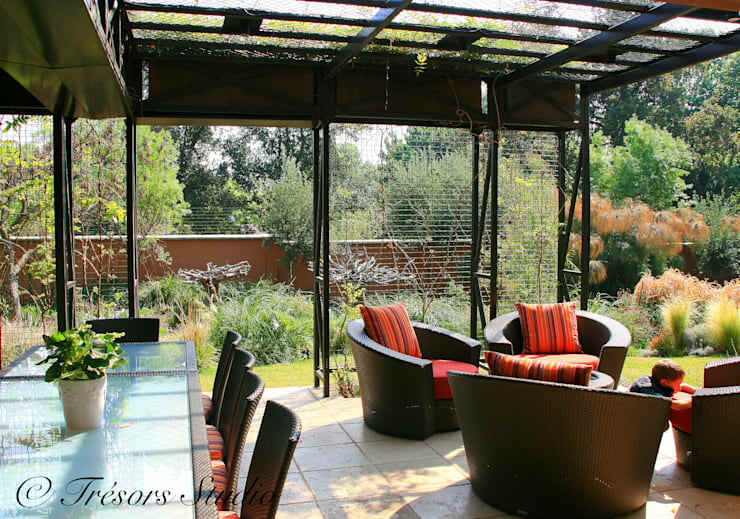 The designers have ensured that you'll never feel like you are in the middle of Johannesburg in this beautiful home. Tip: If you feature cosy and plump cushions like this on your patio and it isn't covered, ensure that you pack them inside when you are not making use of this space. You don't want them to get damaged in the sun or the rain. The tiles make for the perfect patio flooring as they are durable and easy to clean! The terracotta colours also bring warmth and homeliness to this space. Could you picture yourself living in this home?